Surprise hit at London Calling this year. Unknown Mortal Orchestra have been a surprise hit at some of the recent Festivals in Europe this year (London Calling 2013), they were enthusiastically greeted at the Villette Sonique Festival in France, just a few days ago. Pretty good for a band only together for about 3 years. But they aren’t your average band. 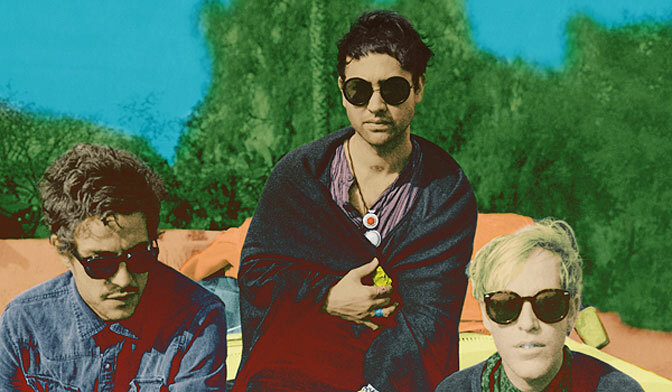 One third American and two thirds New Zealand, Unknown Mortal Orchestra is headed up by singer/guitarist Ruban Nielson, along with bassist Jake Portrait and drummer Riley Geare. They’ve just released (as of February) their second album (aptly titled II), which has been very well received, and this mini-tour is to promote the album but also giving audiences a taste of what’s coming in the Fall. They are slated to do a major European tour starting in November, but before then, in September they’ll be playing the Music Fest NW in Portland on the 6th, and heading down to Los Angeles to do a night at The Troubadour on the 27th. Get tickets. Until then, you can get an idea of what all the excitement is about by sampling this concert, recorded on May 24th by the venerable RFI-Le Mouv’. Further evidence music is heading in good places.